4.12.2014. [cont'd from 2/13/2014] I did some 8-inch practice squares for my Building Blocks Quilt Along -- sandwiches of fabric from Jim's old red shirt and my old white shirt. 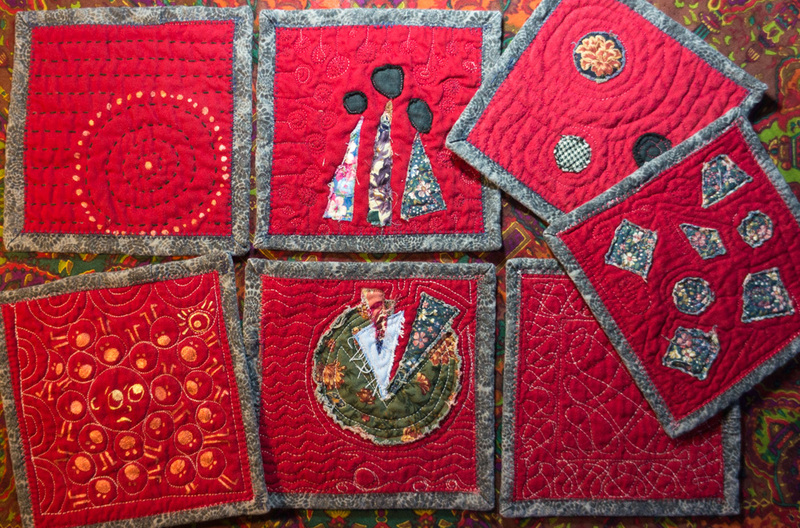 I practiced my free-motion quilting and did some impromptu applique with raw-edge scraps. On my circles practice square, I added fabric paint and entered it into Zuzu's Notebook. I used one to learn big-stitch hand-quilting. They wound up being pretty sweet, so I decided to bind the edges with the leftover bias tape I made for Quilt #5. I didn't think they had the right stuff to be potholders, but maybe they could serve as the world's largest coasters. 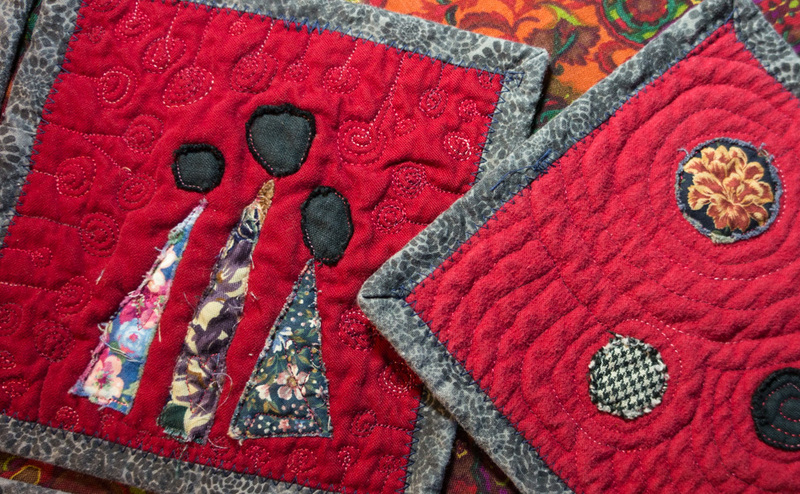 Also, I've been hearing that it is the laundering of a finished cotton quilt that gives it its final "quiltiness" -- when the cotton batting shrinks slightly to create surface crinkles and all the fabric and thread blend into oneness. Here was my opportunity to test this wisdom. As I was doing this, someone in our Off-Topic quilting group showed us the "mug rug" she'd made for her mother-in-law. "Mug rug"! That's what I made! As you can see from this Pinterest page, mug rugs occupy a nice little quilting niche between coasters and placemats. So, with binding, laundering, and naming, my little practice squares have turned from nothing into something.